(Nanowerk News) The jeans you wear, the orange juice you drink, the laundry detergent you use: None would be possible without the activity of enzymes. Currently the enzymes used in industry are produced through an expensive, laborious process, requiring cold storage. But an innovative new approach, ushered in by research from Penn's School of Dental Medicine, is opening up a whole new way of making these valuable proteins. The Penn team put the enzymes into action in "a head-to-head comparison," Daniell says, testing their ability to remove indigo dye from denim ("biowashing"), de-pill knitted fabric ("biopolishing"), and remove chocolate and mustard-oil stains. In all cases, the corresponding Phyllozyme enzymes achieved comparable--and in some cases better--results than their microbial-produced counterparts. Experiments in the Penn Dental Greenhouse, located at Pennovation Works, and at the hydroponic growing facility Fraunhofer demonstrated that producing enzymes in tobacco or lettuce plants could generate significant yields, and that the resulting enzyme products were effective and active, even when plants were harvested at various time points. 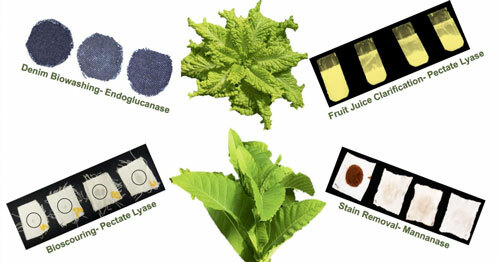 In a second paper (Plant Biotechnology Journal, "Validation of leaf and microbial pectinases: commercial launching of a new platform technology"), which specifically examined pectinases, which are enzymes that break down pectin, a natural component of fruits, an additive to certain foods, and a component of cotton fiber. Juice makers use pectinases to keep their equipment free of pulp build-up. Textile manufacturers use it to break down the coating on cotton that blocks water absorption. Counterintuitively, natural cotton fiber does not absorb water until pectin is removed by enzymes.